My girl Rachel Phillips and I took advantage of a sunny day in NYC this past weekend for a rooftop training sesh! There’s nothin like a view of the Empire state to get you in da zone! All we used was a bench and did a few classic calisthenics exercises to work up a good sweat! Working out doesn’t have to overly complicated! Ain’t nothin to do but to do it! What’s pop’n ninjas? When I first began strength training, I had a lot of issues doing certain moves like overhead presses and push-ups because of pain in my wrists. Thankfully, using exercises I learned from my progressive calisthenics training, I was not only able to eliminate pain in my wrists but also strengthen them! Now I’m able to do all sorts of hand-balancing moves that were once off-limits to me. Click the link below to check out my latest piece for Bodybuilding.com and learn how to BULLETPROOF your wrists! Don’t forget to share this article with your fellow ninjas, too! What’s pop’n ninjas? With a new year on the horizon, it’s about that time when everyone begins to set goals and resolutions. If one of your resolutions is to get better at handbalancing skills, then you may want to get in on my 31-Day Handbalancing Challenge that starts on January 1st! Learning handbalancing is more than just about impressing your friends with your new tricks. It’s about facing your fears and moving beyond them to achieve amazing feats of strength with your own body. Practicing handbalancing can add an element of fun and skill to your regular training regimen that will keep you excited about exercise for years to come! Each day in January, I will post a photo/video of a new skill with some tips on how to achieve it. 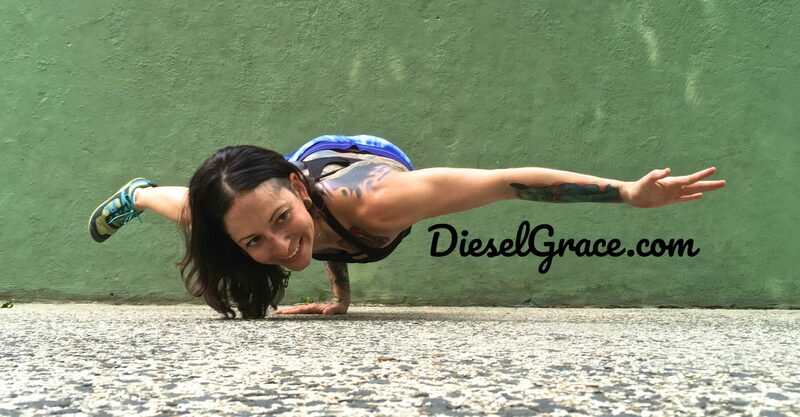 Then you can attempt the move, video or photograph it, post it on your social media page and tag me in it: #DieselGrace. I will post the best photos and videos on my social media daily. Not only will this be a great way for you to learn new skills, but also to inspire others to do the same! What’s pop’n ninjas? I’m stoked that we recently got our new free-standing pull-up bar for the apartment! The Bodyweight Master is Dragondoor‘s latest piece of fitness equipment and it’s better than just your traditional pull-up bar. What’s pop’n, ninjas? I’ve learned so much about myself since embarking on my calisthenics journey –from unlocking new skills, to meeting awesome people in the community, including my hubby, Al Kavadlo! When you embrace bodyweight training as a way of life, you never have any excuses not to train because the world can be your gym! 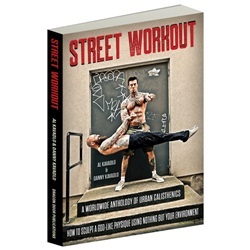 What inspires you to train calisthenics? If it’s the accessibility of being able to train anytime and any place, then you may need to look into getting this awesome pull-up bar from Dragondoor.com! Behold the Bodyweight Master, Dragondoor’s first ever free-standing pull-up bar! Al & I are super stoked to be getting ours shipped soon! It can be kinda brutal to train outdoors during the winters here in NYC, but luckily with our at-home pull-up bar, we can still get some reps in! This pull-up bar station is super sturdy, and has some cool features, including attachments to do dips as well as Aussie pull-ups, too! Click the link above to get yours now and be on the lookout for our official review coming up soon! What’s pop’n? Yoga and calisthenics are both beautiful expressions of all the wondrous ways humans are meant to move! I’ve been practicing yoga for over 10 years now, and I’ve learned many different types of arm balances along the way. Arm balances are more than just a “party trick.” They are fantastic exercises for strengthening your entire body, including your upper body, wrists, and arms as well as a legit way to strengthen your powers of concentration. How many of these different shapes can you ninjas make? I encourage you to be brave and give em a go!